Taiwan has averaged more than 7 per cent annual GDP growth since the 1960s, and is one of Asia’s most advanced – and most export-driven – economies. The EU is Taiwan’s fourth largest trade partner after China, the USA and Japan and the EU and Taiwan hold regular bilateral trade talks. Ireland is actively taking measures to boost bilateral economic relations. 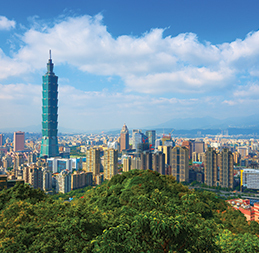 For more detailed information when trading with Taiwan, download our Taiwan Fact Sheet. For an estimate of landed costs (duties, taxes and other import fees) for shipments going to Taiwan use the free and interactive DHL Express Trade Automation Services (TAS) tool, tas.dhl.com. TAS also provides information on regulations compliance and trade documentation. Goods shipments must have invoices attached to the physical shipment upon arrival. The invoice value must be indicated at >+1 (any currency). Pro forma invoices are not accepted by Taiwan Customs. Shipments greater than TWD 3,000: importer to provide Power of Attorney and GUI Number (Tax ID) to authorise clearance of the consignments. Certain items will require inspection from Taiwan’s Bureau of Standards, Metrology & Inspection (BSMI). Contact DHL Customs before importing products made in mainland China. Over 5 L: obtain Licence of Wine & Tobacco. Scotch whiskey: subject to taxation and only released if a Certificate of Age and Origin for Scotch Whiskey issued by UK Customs (HMRC) is provided. Unprocessed: provide original quarantine certificate from country of origin. Label required on the outside of the package to say ‘ANIMAL PRODUCT’. Obtain import licence. Fishmeal: importer to apply for inspection by Taiwan’s BSMI. Provide original quarantine certificate from origin country and apply for import licence. Plant products: provide a label on the outside of the package stating ‘PLANT PRODUCTS’. Subject to inspection and censorship by Taiwan’s Government Information Office (GIO). More than 5 pieces: send as goods. Shipment price above US$ 1,000: obtain certificate of legal import inspection. Wireless equipment including mobile phones: obtain import licence/permit. Shipment value above US$ 1,000 and/or above 6 kg: receiver to provide certificate of legal import inspection. Vitamins: obtain approval from Taiwan’s National Health Administration. Sender to apply for inspection with Taiwan’s BSMI. Receiver to provide authorisation letter from of country of production. Comply with Taiwan’s National Communication Commission (NCC) requirements and complete an affidavit form for approval. Without a certificate issued by NCC, only 2 units may be imported per person or company (no limits for certificate holders). Must be business-related and not be exposed. More than 2 pieces: send as goods. Provide country of origin certificate. Label of origin must be sewn on garment. State contents, material, colour and measurements (length & width) on invoice. Bed clothing, towels and undergarments: sender to obtain import permission from Taiwan’s BSMI before shipment is imported to Taiwan. Provide photocopy of the tobacco importer business license or an approval issued by Taiwan’s Ministry of Finance unless the reason for import is gifting, self-consumption or exhibition and the quantity does not exceed 1,000 cigarettes, 125 cigars or 5 pounds of cut tobacco. Cigarette samples: provide original quarantine certificate from origin. State contents, material, colour and measurements (length & width) on invoice. For x-ray machines please contact DHL Customer Services before shipping.